Belgium's Red Devils have made enormous progress over the past few years as their latest young generation of stars have gained in experience and conﬁdence. 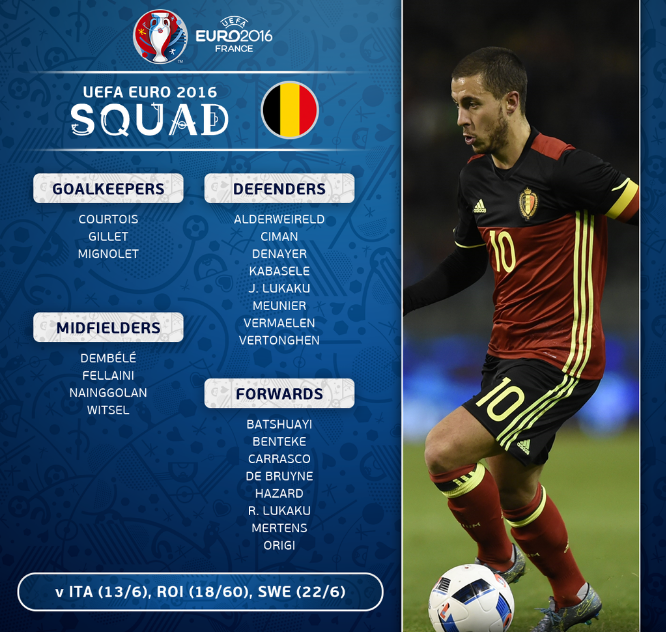 Having suffered just a single defeat in qualifying, and having reached No.1 in the FIFA World Rankings for the ﬁrst time, Marc Wilmots will be taking a Squad to the Euro 2016 ﬁnals that is brimming with conﬁdence. Belgium, with an association formed in 1895 and the second-oldest league outside Great Britain, was one of the driving forces behind the formation of FIFA and was one of only four European nations to travel to Uruguay to participate at the inaugural FIFA World Cup in 1930. But, in comparison to their neighbours, the strictly amateur nature of the domestic game severely hindered the country's progress. The yoke of amateurism was only discarded in 1972, and the introduction of professionalism coincided with an immediate improvement in the fortunes of the national side. From 1972 to 1984 Belgium made the last eight of four successive European Football Championships (only four teams made the ﬁnals in 1976), and in 1980 they reached the ﬁnal for the ﬁrst time, losing narrowly by 2-1 to Germany in Rome. The majority of that 1980 team went on to represent Belgium for the next decade and contained many of the country's most celebrated players, including goalkeeper Jean- Marie Pfaff, full-back Eric Gerets and 96-cap striker Jan Ceulemans. Their ﬁnest hour came at the 1986 FIFA World Cup ﬁnals, where they lost to Argentina in the semi-ﬁnals, with Enzo Scifo the star. Belgium made history when they co-hosted Euro 2000 with the Netherlands, but were unable to rise to the occasion. They were knocked out in the ﬁrst round, but learned from the experience and much the same team then progressed to the second round of the 2002 FIFA World Cup before falling to Brazil. Qualifying for the UEFA Euro ﬁnals proved beyond them over the next decade. However, a rising new generation of highly talented youngsters emerged during those years and they demonstrated their prowess by reaching the quarter-ﬁnals of the 2014 FIFA World Cup before losing 1-0 to eventual tournament runners-up Argentina. Even though he is only 22 years of age, Chelsea's Thibaut Courtois has established himself as one of Europe's most commanding goalkeepers. Premier League stalwarts Toby Alderweireld and Jan Vertonghen from Tottenham, plus Nicolas Lombaerts from Russia's Zenit have brought a defensive consistency Belgium lacked since the days of Eric Gerets and Walter Meeuws in the 1980s. Marc Wilmots has an embarassment of riches up front at his disposal. In midﬁeld, coach Marc Wilmots has been spoiled for choice between Kevin Mirallas, Nacer Chadli, Marouane Fellaini and Axel Witsel, plus the highly creative Kevin de Bruyne and Eden Hazard on the wings. At the apex of attack a further threat on goal comes from the Liverpool pair Christian Benteke and Divock Origi as well as Everton striker Romelu Lukaku. 22-year-old prodigy Michy Batshuayi enjoyed a prolific season for Marseille, scoring 23 goals for the French outfit. De Bruyne and Hazard were Belgium's ﬁve-goal joint leading marksmen in qualifying, followed by Fellaini with four and Dries Mertens with three. 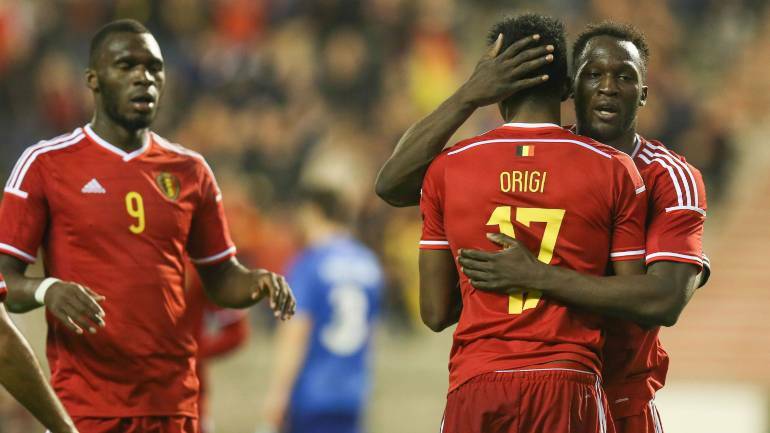 Belgium won seven of their ten games, lost only one, scored 24 goals and conceded only ﬁve. They topped Group B with a two-point advantage over Wales and six ahead of Bosnia and Herzegovina who ended up in the playoffs. The Red Devils got off to a comfortable 6-0 winning Start against Andorra, but failed to build on it after being held 1-1 in Bosnia and 0-0 at home by Wales. Only in March of last year did they pick up speed again when two goals from Manchester United's Fellaini ﬁred them to a 5-0 victory over Cyprus. After that there was no looking back and Belgium ensured progress to the Euro ﬁnals for the ﬁrst time in 16 years with a game to spare following a 4-1 win over Andorra. Belgium are a dark horse for this year's European Championships, and quietely Marc Wilmots' side will be ready to pounce upon any opportunities that arise for a shot at glory. The side is settled and has big tournament experience from the FIFA World Cup two years ago, they have strength in all areas of the pitch and the desire to bring home their first ever major international honour. Belgium are my favourites for the tournament and I'm expecting Eden Hazard to be performing at his best once again if that is to happen. 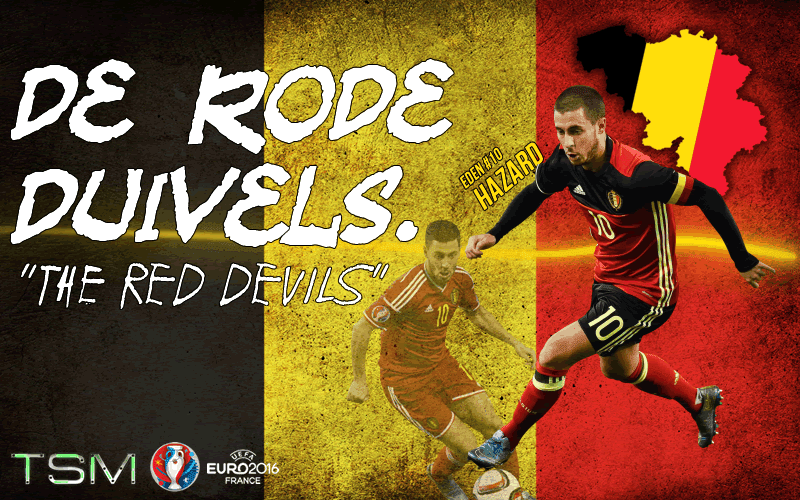 Euro 2016 Preview Series: Belgium.